When traveling through Frankfurt, I always try to pick up a bottle of German wine on the airport. 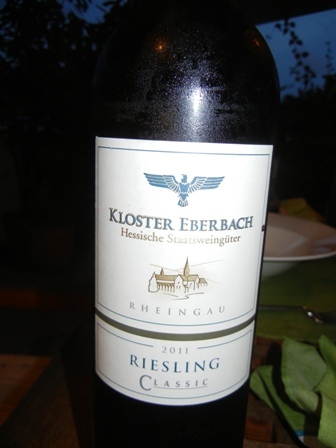 This time it was a ‘2011 Riesling Classic dry’ by the Kloster Eberbach winery in the Rheingau. Little did I know at the time that I would be visiting this place during my holidays a few weeks later. In fact I would return to this wine region twice within two weeks time. To say it in a nutshell, Kloster Eberbach is a fabulous place. It used to be a Cistercian Monastry (by the way in my master thesis I wrote about Cistercian monastries and their farming enterprises which were quite modern as regards organization and management). Grape production and wine-making have a long tradition in this place. Today it is owned and operated by the state of Hessia. This is their “normal” Riesling wine brand, nothing fancy but just a solid German Riesling, the way I like it. The wine is crisp and fresh with great aromas and a good body. The other day in Berlin I had a hearty meal at Brasserie Gendarmenmarkt, one of the most lovely public squares in the German capital. The weather was very nice so we sat outside on the pavement but the inside of the restaurant is worth having a look at. 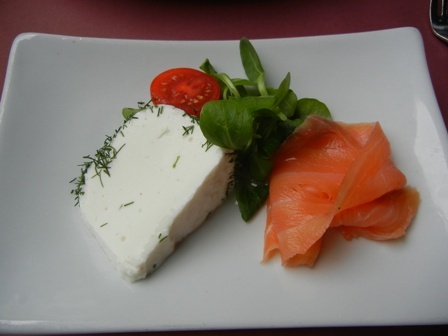 The salmon with the cream cheese was a wonderful starter. Since it was an unusual hot day, a light meal was just the right choice. The main course was a pasta. 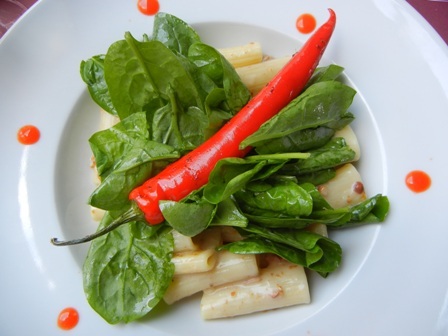 Is the photo of the pasta with the red pepper and the greens not nice? 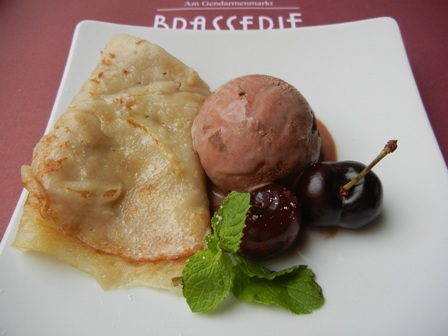 And I could not resist the dessert, some ice cream with a pancake. All very delicious. I had a glass of white wine with the meal. I selected the dry Riesling from the Rheingau. It was a ‘2009 Riesling QbA dry’ by the Debus Winery in Gau-Odernheim, Rheingau. This Riesling wine is for easy drinking, ideal on a hot summer’s day. I decided to visit the Rheingau wine region and learn more about the wines produced in this very famous part of Germany. No blog entry for two weeks, goodness me. Why I am so busy? It seems this is a terible time. No time for my blog. Moroever, I am going on an extended trip to my hometown Trier, Germany (this time on vacation), where I have very ittle access to the internet. Therefore the prospects are grim. Please bear with me. I plan to continue my blog despite the odds. Today I have a last entry before the blog-free seasons starts. The good news is that I will be visiting the Mosel and its tributaries. This also means that I will probably visit some wineries and taste some delicious wines. I should come back to Bangkok with many more stories to tell and share. Last night, we had with our meal a beautiful red. 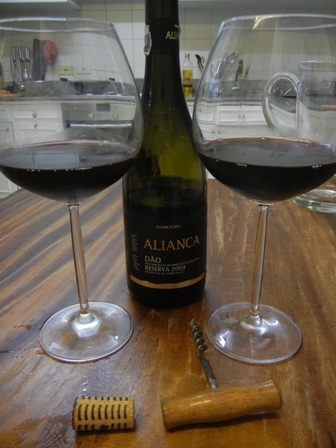 It was a ‘2009 Caves Alianca Dao Reserva’, a blend of various Portuguese grape varieties (the label says: Tinta Roriz, Alfrocheiro, Jaén, Touriga Nacional). The Dao wine region is consistently producing outstanding wines. Ever since our holiday along the Douro river, I am a big fan of Portuguese wines. With 14% alcohol this wine is big and mighty. It is also very smooth with lots of forest fruit. There is some hint of vanilla (from the oak). The wine has a good mid-pallet weight and a long finish. In Europe the wine retails for about 7 Pounds. We had this beautiful and delectable wine with very spicy green beans and a beef fillet. Woh, that meal was super delicious and the wine was just a perfect match. I wish we had more of it. Well. Soon we will be at the shores of the Mosel river and ive into the tasting of Riesling. What a consolation. You are currently browsing the The Man from Mosel River blog archives for July, 2012.